Scroll to the bottom of page for live updates feed. For updates to wildfires managed by the Lone Star State Incident Management Team please visit https://www.facebook.com/lssimt/. We urge residents to prepare and heed warnings from state and local officials. Updated May 11, 2018 at 12:31 p.m. CST. Mallard, Armstrong County, estimated at 20,000 acres, 15 percent contained, multiple spot fires, extreme fire behavior, group torching and crown runs in juniper. Call 432-558-8311 for Mallard Fire Information. Harwood, Hall County, 2,500 acres, 30 percent contained, flanks active, group torching and crown runs, no structures threatened. JA #2 East, Donley County, 700 acres, 75 percent contained; is burning into an old prescribed burn. Low fire activity. Glover, Armstrong County, 3,000 acres with 10 containment. Mechler, Randall County, 800 acres, 70% contained. Mallard, Armstrong County, estimated at 1200 acres, 0 percent contained, multiple spot fires, extreme fire behavior, group torching and crown runs in juniper. Summer Field, Armstrong County, 1000 acres, 0 percent contained; the fire is south of the Mallard and is expected to burn through a canyon and join the Mallard Fire. Extreme fire behavior, group torching and crown runs in juniper. Hilltop Fire, Reagan County: estimated 727 acres, 100% contained. 2287 Fire, Callahan County: estimated 18 acres, 100% contained. McClellan Fire, Gray County: estimated 32,100 acres, 100% contained. 287 Fire, Armstrong County: 477 acres, 100% contained. McClellan Fire, Gray County: estimated 32,100 acres, 80% contained. Crews patrolling and mopping up. A DPS helicopter will GPS the fire perimeter later today. 287 Fire, Armstrong County: estimated 1,500 acres, 50% contained. Fireline construction is complete and crews are patrolling and mopping up. McCracken Fire, Gray County: 86 acres, 95% contained. Vanderburg Fire, Gray County: 498 acres, 90% contained. No active fire. Crews are patrolling and mopping up. McClellan Fire, Gray County: estimated 32,100 acres, 60% contained. Fire behavior is smoldering, crews working on completing containment line, patrolling and mopping up. Confirmed 1 home, 1 garage, and 1 other structure lost. McClellan Fire, Gray County: estimated 32,100 acres, 60% containment. Fire behavior is smoldering, crews working on completing containment line, patrolling and mopping up. Confirmed 1 home, 1 garage, and 1 other structure lost. McClellan Fire, Gray County: estimated 13,000 acres, 10% containment. Fire behavior has moderated some and the fire is staying south/west of 1321 at this time. Crews are prioritizing structure protection and construction of fireline on the south flank in preparations for the wind shift overnight. Structures threatened. Locals encouraged to heed warnings from local emergency management. McClellan Fire, Gray County: estimated 6000 acres, 10% containment, active fire behavior, ground and air resources on scene, fire has crossed FM 291 and is heading east. Wind direction expected to shift over night. Structures threatened. Locals encouraged to heed warnings from local emergency management. Carbon, Wheeler County – this fire has burned an estimated 12,530 acres and is 75 percent contained. 2473, Gray County – this fire has burned an estimated 805 acres and is 80 percent contained. High Plains, Hutchinson County – this fire has burned an estimated 501 acres and is 90 percent contained. Harbor Bay, Hutchinson County (FMAG) – this fire has burned an estimated 1,109 acres and is 90 percent contained. CR 26, Wheeler County – this fire has burned an estimated 1,386 acres and is 95 percent contained. Check Point, Kenedy County – this fire has burned an estimated 1,155 acres and is 100 percent contained. Walston, Mason County – this fire has burned an estimated 1,400 acres and is 100 percent contained. 206, Lea County, NM – this fire has burned an estimated 49,785 acres (5,923 ac. in Cochran Co, TX) and is 100 percent contained. CR 205, Crockett County – this fire has burned an estimated 4,173 acres and is 100 percent contained. CR26 Fire, Wheeler County: 1,386 acres and 95% contained. Harbor Fire, Hutchinson County: 1,190 acres, 90% contained. Milliron Fire, Collingsworth County: 29,979 acres, 90% containment. Carbon Fire, Wheeler County: 12,530 acres, 95% containment. 206 Fire, Cochran County: crossed into Texas from New Mexico; estimated 49,785 acres with 5,590 acres in Texas, and 95% containment. CR26 Fire, Wheeler County: estimated 2,500 acres and 80% contained. Crews are continuing to construct fireline and burn out pockets. The head of the fire has reached the Carbon Fire burn scar. Harbor Fire, Hutchinson County: 1,190 acres, 90% contained. Forward progress stopped. Structures reported as lost. Visit https://twitter.com/BorgerOem or https://www.facebook.com/borger.oem/ for more information. Milliron Fire, Collingsworth County: 29,979 acres, 75% containment. Crews are engaged in fireline construction. Carbon Fire, Wheeler County: 12,530 acres, 75% containment. Crews are burning out pockets and reinforcing line. CR26 Fire, Wheeler County: estimated 300 acres. Very active fire on south flank. Crews constructing line on north and south flanks. Harbor Fire, Hutchinson County: 1,109 acres, 90% contained. Forward progress stopped. Structures reported as lost. Visit https://twitter.com/BorgerOem or https://www.facebook.com/borger.oem/ for more information. Milliron Fire, Collingsworth County: 29,979 acres, 50% containment. Crews are engaged in fireline construction. 335 Fire, Jones County: 2,625 acres, 100% contained. Structures reported as lost. Loma Alto Fire, Val Verde County: 250 acres, 100% contained. Craig Road Fire, Howard County: 350 acres, 75% containment. Forward progress stopped. Ames Fire, Eastland County: 130 acres, 100% contained. Glenn Fire (formerly Ron James Fire and Ken Williams Fire), Dickens County: 3,100 acres, 100% contained. Milliron Fire, Collingsworth County: 26,979 acres, 20% containment. Moderate fire behavior. Crews are engaged in fireline construction. 335 Fire, Jones County: estimated 1000 acres with 50% containment. Active fire behavior. Structures reported as lost. CR Road Fire, Crockett County: estimated 2,500 acres with 20% containment. Loma Alto Fire, Val Verde County: estimated 250 acres with 10% containment. Forward progress has been stopped. Craig Road Fire, Howard County: estimated 350 acres, 75% containment. Forward progress stopped. Ames Fire, Eastland County: estimated 150 acres with 50% containment. Forward progress stopped. 206 Fire, Cochran County: crossed into Texas from New Mexico; estimated 30,000 acres with 4,000 in Texas, and 85% containment. Glenn Fire (formerly Ron James Fire and Ken Williams Fire), Dickens County: combined acreage is estimated at 5,500 with 90% contained. Crews patrolling and conducting mop up. Neill Fire, Howard County: 117 acres, 100% contained. 126 Lake Fire, Jones county: estimated 40 acres with 100% containment. Canadian River Fire, Potter County: 922 acres, 100% contained. Carbon Fire, Wheeler County: 7,500 acres, 40% containment, no threats, Ground crews are working to build containment line around the fire. Canadian River Fire, Potter County: 922 acres, 90% contained. Craig Road Fire, Howard County: estimated 350 acres, 75% containment, forward progress stopped. Milliron Fire, Collingsworth County: 26,979 acres, 20% containment. Moderate fire behavior. Crews making good progress. Harbor Fire, Hutchinson County: estimated 1000 acres, 75% contained. Forward progress stopped. Homes threatened. Structures reported as lost. Visit https://twitter.com/BorgerOem or https://www.facebook.com/borger.oem/ for more information. Ron James Fire and Ken Williams Fire, Dickens County: combined acreage is estimated at 5,500 with 65% contained. Crews making good progress. Neill Fire, Howard County: estimated 200 acres, 100% contained. Milliron Fire, Collingsworth County: estimated 3,500 acres, 25% containment. Moderate fire behavior. Crews making good progress. Harbor Fire, Hutchinson County: estimated 1000 acres, 75% contained. Forward progress stopped. Homes threatened. Structures reported as lost. https://twitter.com/BorgerOem or https://www.facebook.com/borger.oem/ for more information. 126 Lake Fire, Jones county: estimated 40 acres with 100% containment. Near Hamlin. Local volunteer fire departments and county maintainer have stopped forward progress of fire. Ron James Fire and Ken Williams Fire, Dickens County: combined acreage is estimated at 6,500 with 65% contained. Crews making good progress. Carbon Fire, Wheeler County: 6,000 acres, 5% containment, homes threatened, Ground crews are working to build containment line around the fire. Craig Road Fire, Howard County: estimated 300 acres, 20% containment, forward progress stopped, structures threatened, several lost. Ground crews making good progress. Harbor Fire, Hutchinson County: estimated 1000 acres, 20% contained. Homes threatened. Structures reported as lost. Evacuations reported. https://twitter.com/BorgerOem or https://www.facebook.com/borger.oem/ for more information. 335 Fire, Jones County: estimated 1000 acres with 30% containment. Active fire behavior. Ron James Fire and Ken Williams Fire, Dickens County: combined acreage is estimated at 3,000 with 40% contained. Very active fire behavior. Carbon Fire, Wheeler County: 6,000 acres and growing, 5% containment, homes threatened, 3 Single Engine Air Tankers and ground crews are working the fire. Ground crews are working the fire line and structure protection in Texola, OK and dispersed homes south of town. 126 Lake Fire, Jones county: estimated 40 acres with 70% containment. Near Hamlin. Local volunteer fire departments and county maintainer have stopped forward progress of fire. Harbor Fire, Hutchinson County: estimated 800 acres, 0% contained. Homes threatened. Structures reported as lost. Evacuations reported. https://twitter.com/BorgerOem or https://www.facebook.com/borger.oem/ for more information. 126 Lake Fire, Jones county: estimated 40 acres with 30% containment. Near Hamlin. Local volunteer fire departments and county maintainer have stopped forward progress of fire. Harbor Fire, Hutchinson County: estimated 800 acres, 0% contained. Homes threatened. Evacuations reported. https://twitter.com/BorgerOem or https://www.facebook.com/borger.oem/ for more information. 294 Fire: Wildfire is in Armstrong and Donley counties. Estimated 14,482 acres with 95% containment. Twenty-four homes were saved. One home unoccupied, 1 commercial barn, 3 other miscellaneous outbuildings and approximately 80 round bales of hay, is the total losses for this fire. Fire is in mop-up and patrol status. Updated: 10:27 a.m. CST April 8, 2018. 294 Fire: Wildfire is in Armstrong and Donley counties. Estimated 14,482 acres with 80% containment. Twenty-four homes were saved. One home unoccupied, 1 commercial barn, 3 other miscellaneous outbuildings and approximately 80 round bales of hay, is the total losses for this fire. Fire is in mop-up status. Updated: 10:42 a.m. CST April 6, 2018. 294 Fire: Wildfire is burning in Armstrong and Donley counties. Estimated 15,000 acres with 60% containment. Twenty-four homes were saved. One home unoccupied, 1 commercial barn, 3 other miscellaneous outbuildings and approximately 80 round bales of hay, is the total losses for this fire. Fire is within containment lines at this point Crews are crews are working the southern edge of the fire south of HWY 287 in the canyon area. North of HWY 287 there is no currently reported fire activity. Last updated 1:58 p.m. CST April 4, 2018. 294 Fire: Wildfire is burning in Armstrong and Donley counties. Estimated 15,000 acres with 60% containment. Four structures reported as lost, no occupied homes were lost. Crews are crews are working the southern edge of the fire south of HWY 287 in the canyon area. North of HWY 287 there is no currently reported fire activity. Last updated 10:48 a.m. CST April 4, 2018. 294 Fire: Wildfire is burning in Armstrong and Donley counties. Estimated 11,000 acres with 50% containment. Four structures reported as lost, no occupied homes were lost. Crews are crews are working the southern edge of the fire south of HWY 287 in the canyon area. North of HWY 287 there is no currently reported fire activity. Last updated 9:48 a.m. CST April 4, 2018. 294 Fire: Wildfire is burning in Armstrong and Donley counties. Estimated 11,000 acres with 50% containment. Four structures reported as lost, no occupied homes were lost. Crews are crews are working the southern edge of the fire south of HWY 287 in the canyon area. Last updated 9:50 p.m CST April 3, 2018. 294 Fire: Wildfire is burning in Armstrong and Donley counties. Estimated 11,000 acres with 50% containment. Three structures reported as lost with multiple structures threatened. Crews are crews are working the southern edge of the fire south of HWY 287 in the canyon area. Last updated 7:19 p.m CST April 3, 2018. 294 Fire: Wildfire is burning in Armstrong and Donley counties. Estimated 11,000 acres with 50% containment. Three structures reported as lost with multiple structures threatened. Three large air tankers and two type 1 helicopters have been ordered. Last updated at 4:14 p.m. CST . Texas A&M Forest Service has 58 responders, including the Texas Intrastate Fire Mutual Aid System. Teams are positioned throughout Texas to help in hurricane response. View the response map here. This will be the last Harvey update. Kirby Ranch Fire: Runnels County, 1115 acres with 100% containment. Texas A&M Forest Service, Ballinger VFD, Talpa VFD, Winters VFD and Coleman FD responded. Texas Department of Transportation also assisted. Sultiemier Ranch Fire: Concho County, estimated 300 acres with 0% containment. Texas A&M Forest Service has 106 responders, including the Texas Intrastate Fire Mutual Aid System. Teams are positioned throughout Texas to help in hurricane response. View the response map here. The Texas Intrastate Fire Mutual Aid System provides local fire trucks and firefighters to support state emergency response operations. The program, run through Texas A&M Forest Service, has mobilized 66 firefighters with 17 fire engines from across the state. Response locations include Orange County, Hardin County and Aransas County. Regional Staging Areas (RSAs) are temporary locations established to house, sort and manage a variety of supplies and commodities needs in the areas affected by Hurricane Harvey. RSA locations include Beeville. Support locations have been set up along the Texas Gulf Coast in an effort to provide assistance in coordinating response efforts of local disaster districts and emergency operations centers. Support locations include Austin, College Station, Lufkin and Corpus Christi. Texas A&M Forest Service has 115 responders, including the Texas Intrastate Fire Mutual Aid System. Teams are positioned throughout Texas to help in hurricane response. View the response map here. The Texas Intrastate Fire Mutual Aid System provides local fire trucks and firefighters to support state emergency response operations. The program, run through Texas A&M Forest Service, has mobilized 66 firefighters with 17 fire engines from across the state. Response locations include Orange County and Aransas County. Regional Staging Areas (RSAs) are temporary locations established to house, sort and manage a variety of supplies and commodities needs in the areas affected by Hurricane Harvey. RSA locations include Beaumont and Beeville. Support locations have been set up along the Texas Gulf Coast in an effort to provide assistance in coordinating response efforts of local disaster districts and emergency operations centers. Support locations include Austin, College Station, Lufkin, Beaumont, Corpus Christi and Hardin County. 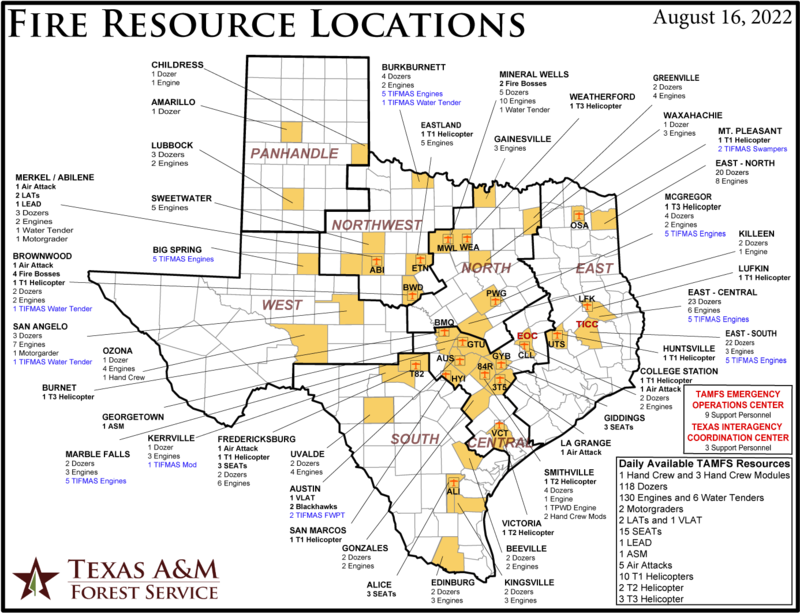 Texas A&M Forest Service has 119 responders, including the Texas Intrastate Fire Mutual Aid System. Teams are positioned throughout Texas to help in hurricane response. View the response map here. The Texas Intrastate Fire Mutual Aid System provides local fire trucks and firefighters to support state emergency response operations. The program, run through Texas A&M Forest Service, has mobilized 60 firefighters with 17 fire engines from across the state. Response locations include Orange County and Aransas County. Texas A&M Forest Service has 142 responders, including the Texas Intrastate Fire Mutual Aid System. Teams are positioned throughout Texas to help in hurricane response. View the response map here. The Texas Intrastate Fire Mutual Aid System provides local fire trucks and firefighters to support state emergency response operations. The program, run through Texas A&M Forest Service, has mobilized 83 firefighters with 23 fire engines from across the state. Response locations include, Orange County, Galveston and Aransas County. Texas A&M Forest Service has 273 responders, including the New York State Department of Emergency Management Type 3 Incident Management Team. Teams are positioned throughout Texas to help in hurricane response. View the response map here. The Texas Intrastate Fire Mutual Aid System provides local fire trucks and firefighters to support state emergency response operations. The program, run through Texas A&M Forest Service, has mobilized 114 firefighters with 30 fire engines from across the state. Response locations include, Orange County, Port Arthur, Galveston and Rockport. Support locations have been set up along the Texas Gulf Coast in an effort to provide assistance in coordinating response efforts of local disaster districts and emergency operations centers. Support locations include Austin, College Station, Lufkin, Beaumont, Rockport, Corpus Christi, Jasper/Newton County, Nacogdoches and Hardin County. 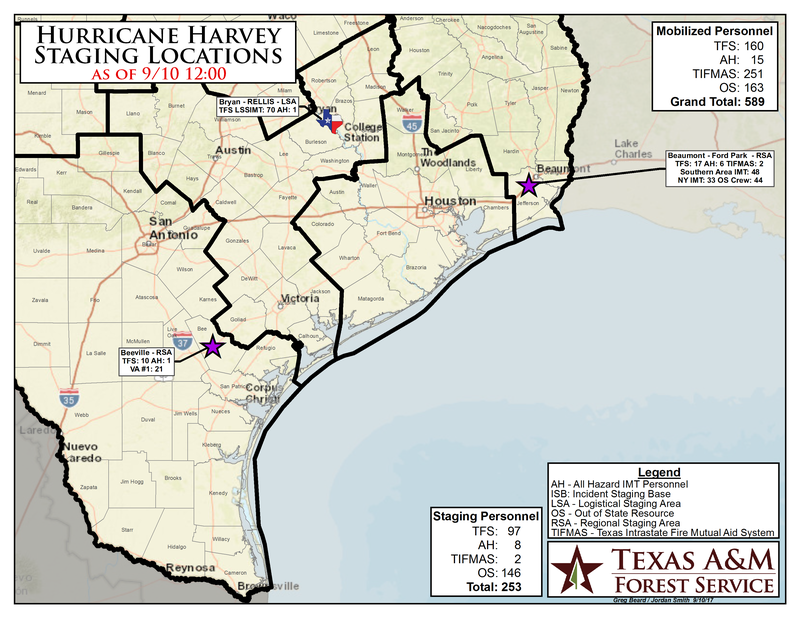 Texas A&M Forest Service has 360 responders, including Texas all hazard incident management team members, the Lone Star State Incident Management Team (LSSIMT), and the New York State Department of Emergency Management Type 3 Incident Management Team. Teams are positioned throughout Texas to help in hurricane response. View the response map here. The Texas Intrastate Fire Mutual Aid System provides local fire trucks and firefighters to support state emergency response operations. The program, run through Texas A&M Forest Service, has mobilized 120 firefighters with 32 fire engines from across the state. Response locations include, Hardin County, Orange County, Port Arthur, Galveston and Rockport. Regional Staging Areas (RSAs) are temporary locations established to house, sort and manage a variety of supplies and commodities needs in the areas affected by Hurricane Harvey. RSA locations include Beaumont, Beeville, and Bryan-College Station. Support locations have been set up along the Texas Gulf Coast in an effort to provide assistance in coordinating response efforts of local disaster districts and emergency operations centers. Support locations include Austin, College Station, Lufkin, Beaumont, Richmond, Rockport, Corpus Christi, Jasper/Newton County, Nacogdoches, Jefferson County and Hardin County. The Texas A&M Forest Service Lone Star State Incident Management Team (LSSIMT) has positioned in Bryan-College Station at the Texas A&M University System RELLIS campus and is assisting local government with coordination of food and water. Texas A&M Forest Service has 544 responders, including Texas all hazard incident management team members, the Lone Star State Incident Management Team (LSSIMT), the Virginia Department of Forestry Type 3 Incident Management Team, Arizona Type 3 Incident Management Team and New York State Department of Emergency Management Type 3 Incident Management Team. Teams are positioned throughout Texas to help in hurricane response. View the response map here. The Texas Intrastate Fire Mutual Aid System provides local fire trucks and firefighters to support state emergency response operations. The program, run through Texas A&M Forest Service, has mobilized 240 firefighters with 6 boats and 53 fire engines from across the state. Response locations include Harris County, Beaumont, Hardin County, Orange County, Port Arthur, Galveston, Rockport, Aransas Pass and Fulton. Support locations have been set up along the Texas Gulf Coast in an effort to provide assistance in coordinating response efforts of local disaster districts and emergency operations centers. Support locations include Austin, College Station, Lufkin, Beaumont, Richmond, Bridge City, Rockport, Corpus Christi, Jasper/Newton County, Nacogdoches, Jefferson County and Hardin County. Texas A&M Forest Service has 675 responders, including Texas all hazard incident management team members, the Lone Star State Incident Management Team (LSSIMT), the Virginia Department of Forestry Type 3 Incident Management Team, Arizona Type 3 Incident Management Team and New York State Department of Emergency Management Type 3 Incident Management Team. Teams are positioned throughout Texas to help in hurricane response. The Texas Intrastate Fire Mutual Aid System provides local fire trucks and firefighters to support state emergency response operations. The program, run through Texas A&M Forest Service, has mobilized 247 firefighters with 6 boats and 69 fire engines from across the state. View the current TFS response map for TIFMAS. Response locations include Harris County, Beaumont, Hardin County, Orange County, Port Arthur, Galveston, Refugio, Rockport, Aransas Pass and Ingleside. Regional Staging Areas (RSAs) are temporary locations established to house, sort and manage a variety of supplies and commodities needs in the areas affected by Hurricane Harvey. View currently TFS response map for Regional Staging Areas. RSA locations include Beaumont, Beeville, and Bryan-College Station. Support locations have been set up along the Texas Gulf Coast in an effort to provide assistance in coordinating response efforts of local disaster districts and emergency operations centers. 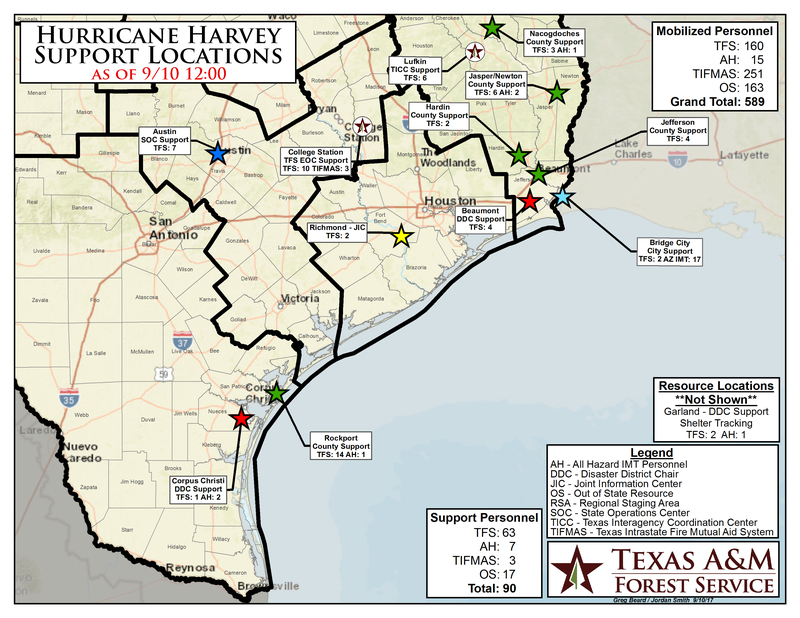 View the current TFS response map of Support locations. Support locations include Austin, College Station, Lufkin, Beaumont, Richmond, Bridge City, Rockport, Corpus Christi, Jasper/Newton County, Nacogdoches, Jefferson County and Hardin County. Texas A&M Forest Service has 756 responders, including Texas all hazard incident management team members, the Lone Star State Incident Management Team (LSSIMT), the Type 2 New York City Fire Department Incident Management Team, Oklahoma Type 3 Incident Management Team, the Virginia Department of Forestry Type 3 Incident Management Team, Virginia Department of Emergency Management Type 3 Incident Management Team, Arizona Type 3 Incident Management Team and New York State Department of Emergency Management Type 3 Incident Management Team. Teams are positioned throughout Texas to help in hurricane response. The Texas Intrastate Fire Mutual Aid System provides local fire trucks and firefighters to support state emergency response operations. The program, run through Texas A&M Forest Service, has mobilized 251 firefighters with 6 boats and 69 fire engines from across the state. View the current TFS response map for TIFMAS. Response locations include Harris County, Beaumont, Hardin County, Orange County, Port Arthur, Galveston, Refugio, Rockport, Aransas Pass and Ingleside. Regional Staging Areas (RSAs) are temporary locations established to house, sort and manage a variety of supplies and commodities needs in the areas affected by Hurricane Harvey. View currently TFS response map for Regional Staging Areas. RSA locations include Beaumont, Katy, Seguin, Beeville, and Bryan-College Station. Support locations have been set up along the Texas Gulf Coast in an effort to provide assistance in coordinating response efforts of local disaster districts and emergency operations centers. View the current TFS response map of Support locations. Support locations include Austin, College Station, Lufkin, Beaumont, Harris County, Richmond, Angleton, Bridge City, Rockport, Corpus Christi, Refugio, Jasper/Newton County, Nacogdoches, Jefferson County, Hardin County and Victoria. Texas A&M Forest Service has 890 responders, including Texas all hazard incident management team members, the Lone Star State Incident Management Team (LSSIMT), the Type 2 Southern Area Incident Management Team, the Type 2 New York City Fire Department Incident Management Team, Oklahoma Type 3 Incident Management Teams, the South Carolina Forestry Commission Type 3 Incident Management Team, South Carolina Type 3 Incident Management Team #2, the Virginia Department of Forestry Type 3 Incident Management Team, Virginia Department of Emergency Management Type 3 Incident Management Team, Wisconsin Type 3 Incident Management Team, North Carolina Forest Service Type 3 Incident Management Team, Arizona Type 3 Incident Management Team and New York State Department of Emergency Management Type 3 Incident Management Team . Teams are positioned throughout Texas to help in hurricane response. Regional Staging Areas (RSAs) are temporary locations established to house, sort and manage a variety of supplies and commodities needs in the areas affected by Hurricane Harvey. View currently TFS response map for Regional Staging Areas. RSA locations include Beaumont, Houston, Fort Bend, Katy, Seguin, Beeville, Lufkin and Bryan-College Station. Support locations have been set up along the Texas Gulf Coast in an effort to provide assistance in coordinating response efforts of local disaster districts and emergency operations centers. View the current TFS response map of Support locations. Support locations include Austin, College Station, Lufkin, Beaumont, Harris County, Richmond, Angleton, Bridge City, Rockport, Corpus Christi, Woodsboro, Refugio, Jasper/Newton County, Nacogdoches, Jefferson County, Hardin County and Victoria. Texas A&M Forest Service has 891 responders, including Texas all hazard incident management team members, the Lone Star State Incident Management Team (LSSIMT), the Type 2 Southern Area Incident Management Team, the Type 2 New York City Fire Department Incident Management Team, Oklahoma Type 3 Incident Management Teams, the South Carolina Forestry Commission Type 3 Incident Management Team, South Carolina Type 3 Incident Management Team #2, the Virginia Department of Forestry Type 3 Incident Management Team, Virginia Department of Emergency Management Type 3 Incident Management Team, Wisconsin Type 3 Incident Management Team, North Carolina Forest Service Type 3 Incident Management Team, Arizona Type 3 Incident Management Team and New York State Department of Emergency Management Type 3 Incident Management Team . Teams are positioned throughout Texas to help in hurricane response. The Texas Intrastate Fire Mutual Aid System provides local fire trucks and firefighters to support state emergency response operations. The program, run through Texas A&M Forest Service, has mobilized 246 firefighters with 6 boats and 69 fire engines from across the state. View the current TFS response map for TIFMAS. Response locations include Harris County, Beaumont, Hardin County, Orange County, Port Arthur, Galveston, Refugio, Rockport, Aransas Pass and Ingleside. Texas A&M Forest Service has 1,041 responders, including Texas all hazard incident management team members, the Lone Star State Incident Management Team (LSSIMT), the Type 2 Southern Area Incident Management Team, the Type 2 New York City Fire Department Incident Management Team, two Oklahoma Type 3 Incident Management Teams, the South Carolina Forestry Commission Type 3 Incident Management Team, South Carolina Type 3 Incident Management Team #2, the Virginia Department of Forestry Type 3 Incident Management Team, Virginia Department of Emergency Management Type 3 Incident Management Team, Wisconsin Type 3 Incident Management Team, North Carolina Forest Service Type 3 Incident Management Team, Arizona Type 3 Incident Management Team and New York State Department of Emergency Management Type 3 Incident Management Team . Teams are positioned throughout Texas to help in hurricane response. The Texas Intrastate Fire Mutual Aid System provides local fire trucks and firefighters to support state emergency response operations. The program, run through Texas A&M Forest Service, has mobilized 382 firefighters with 14 boats and 111 fire engines from across the state. View the current TFS response map for TIFMAS. Response locations include Harris County, Beaumont, Hardin County, Orange County, Port Arthur, Galveston, Refugio, Rockport, Aransas Pass and Ingleside. Regional Staging Areas (RSAs) are temporary locations established to house, sort and manage a variety of supplies and commodities needs in the areas affected by Hurricane Harvey. View currently TFS response map for Regional Staging Areas. RSA locations include Beaumont, Houston, Victoria, Fort Bend, Katy, Seguin, Beeville, Lufkin and Bryan-College Station. Support locations have been set up along the Texas Gulf Coast in an effort to provide assistance in coordinating response efforts of local disaster districts and emergency operations centers. View the current TFS response map of Support locations. Support locations include Austin, College Station, Lufkin, Conroe, Beaumont, Harris County, Richmond, Texas City, Angleton, Pierce, Rockport, Corpus Christi, Woodsboro, Refugio, Jasper, Nacogdoches and Victoria. Texas A&M Forest Service has 1,001 responders, including Texas all hazard incident management team members, the Lone Star State Incident Management Team (LSSIMT), the Type 2 Southern Area Incident Management Team, the Type 2 New York City Fire Department Incident Management Team, two Oklahoma Type 3 Incident Management Teams, the South Carolina Forestry Commission Type 3 Incident Management Team, South Carolina Type 3 Incident Management Team #2, the Virginia Department of Forestry Type 3 Incident Management Team, Virginia Department of Emergency Management Type 3 Incident Management Team, Wisconsin Type 3 Incident Management Team, North Carolina Forest Service Type 3 Incident Management Team, Arizona Type 3 Incident Management Team and New York State Department of Emergency Management Type 3 Incident Management Team . Teams are positioned throughout Texas to help in hurricane response. The Texas Intrastate Fire Mutual Aid System provides local fire trucks and firefighters to support state emergency response operations. The program, run through Texas A&M Forest Service, has mobilized 425 firefighters with 14 boats and 94 fire engines from across the state. View the current TFS response map for TIFMAS. Response locations include Beaumont, Bridge City, Port Arthur, Dickinson, Galveston, Refugio, Rockport, Aransas Pass and Ingleside. Texas A&M Forest Service has 1,119 responders, including Texas all hazard incident management team members, the Lone Star State Incident Management Team (LSSIMT), the Type 2 Southern Area Incident Management Team, the Type 2 New York City Fire Department Incident Management Team, two Oklahoma Type 3 Incident Management Teams, the South Carolina Forestry Commission Type 3 Incident Management Team, South Carolina Type 3 Incident Management Team #2, the Virginia Department of Forestry Type 3 Incident Management Team, Virginia Department of Emergency Management Type 3 Incident Management Team, Wisconsin Type 3 Incident Management Team and New York State Department of Emergency Management Type 3 Incident Management Team . Teams are positioned throughout Texas to help in hurricane response. The Texas Intrastate Fire Mutual Aid System provides local fire trucks and firefighters to support state emergency response operations. The program, run through Texas A&M Forest Service, has mobilized 536 firefighters with 48 boats and 103 fire engines from across the state. View the current TFS response map for TIFMAS. Response locations include Kemah, Beaumont, Bridge City, Port Arthur, Dickinson, Galveston, Refugio, Rockport, Aransas Pass and Ingleside. Texas A&M Forest Service has 1,059 responders, including Texas all hazard incident management team members, the Lone Star State Incident Management Team (LSSIMT), the Type 2 Southern Area Incident Management Team, the Type 2 New York City Fire Department Incident Management Team, two Oklahoma Type 3 Incident Management Teams, the South Carolina Forestry Commission Type 3 Incident Management Team, South Carolina Type 3 Incident Management Team #2, the Virginia Department of Forestry Type 3 Incident Management Team. Teams are positioned throughout Texas to help in hurricane response. The Texas Intrastate Fire Mutual Aid System provides local fire trucks and firefighters to support state emergency response operations. The program, run through Texas A&M Forest Service, has mobilized 530 firefighters with 47 boats and 100 fire engines from across the state. View the current TFS response map for TIFMAS. Response locations include Kemah, Beaumont, Bridge City, Port Arthur, Dickinson, Galveston, Refugio, Rockport, Aransas Pass and Ingleside. Texas A&M Forest Service has 1,020 responders, including Texas all hazard incident management team members, the Lone Star State Incident Management Team (LSSIMT), the Type 2 Southern Area Incident Management Team, the Type 2 New York City Fire Department Incident Management Team, two Oklahoma Type 3 Incident Management Teams, the South Carolina Forestry Commission Type 3 Incident Management Team and the Virginia Department of Forestry Type 3 Incident Management Team. Teams are positioned throughout Texas to help in hurricane response. The Texas Intrastate Fire Mutual Aid System provides local fire trucks and firefighters to support state emergency response operations. The program, run through Texas A&M Forest Service, has mobilized 512 firefighters with 47 boats and 100 fire engines from across the state. View the current TFS response map for TIFMAS. Response locations include Kemah, Beaumont, Bridge City, Port Arthur, Dickinson, Galveston, Refugio, Rockport, Aransas Pass and Ingleside. Regional Staging Areas (RSAs) are temporary locations established to house, sort and manage a variety of supplies and commodities needs in the areas affected by Hurricane Harvey. View currently TFS response map for Regional Staging Areas. RSA locations include Beaumont, Houston, Victoria, Fort Bend, Katy, Seguin, Beeville and Bryan-College Station. Support locations have been set up along the Texas Gulf Coast in an effort to provide assistance in coordinating response efforts of local disaster districts and emergency operations centers. View the current TFS response map of Support locations. Support locations include Austin, College Station, Lufkin, Conroe, Beaumont, Harris County, Richmond, Texas City, Angleton, Pierce, Rockport, Corpus Christi, Woodsboro, Refugio and Victoria. While the impacts across the state and along the coast may vary, we are expecting heavy rains and flooding conditions to continue through early next week. Texas A&M Forest Service has 401 emergency responders, including Texas all hazard incident management team members, Southern Area Incident Management, New York City Fire Department Incident Management Team, Two Oklahoma Type three incident management teams, South Carolina Forestry Commission Type three Incident Management Team and Virginia Department of Forestry Type three Incident Management Team. Teams are positioned throughout Texas to help in hurricane response. View the current TFS Response map. They are currently positioned in Victoria, Corpus Christi, Ingleside, Rockport, Refugio, Pierce, Texas City, Lufkin, Austin, Houston, Richmond, Fort Bend, Dickenson, Seadrift, Woodsboro, Aransas Pass, Katy, Montgomery, Ford Park, Angelton, Beeville, Webster, Beaumont, Port Arthur, Conroe and Bryan-College Station. The Texas A&M Forest Service Lone Star State Incident Management Team (LSSIMT) has positioned in Rockport and is assisting local government with coordination of food and water. Through the Texas Intrastate Fire Mutual Aid System (TIFMAS), 549 firefighters with 47 boats and 91 fire engines have mobilized to Houston and other areas in the path of the storm. Texas A&M Forest Service has 347 emergency responders, including Texas all hazard incident management team members, Southern Area Incident Management, New York City Fire Department Incident Management Team, Two Oklahoma Type 3 incident management teams. Team positioned throughout Texas to help in hurricane response. View the current TFS Response map. They are currently positioned in Victoria, Corpus Christi, Ingleside, Rockport, Refugio, Pierce, Texas City, Lufkin, Austin, Houston, Richmond, Fort Bend, Dickenson, Seadrift, Woodsboro, Aransas Pass, Katy, Montgomery, Ford Park, Angelton, Beeville, Webster and Bryan-College Station. The Texas A&M Forest Service Lone Star State Incident Management Team (LSSIMT) has positioned in Rockport and is responding to rescue efforts by assisting with evacuations and conducting roadway assessments. Through the Texas Intrastate Fire Mutual Aid System (TIFMAS), 491 firefighters have mobilized to Houston and other areas in the path of the storm. 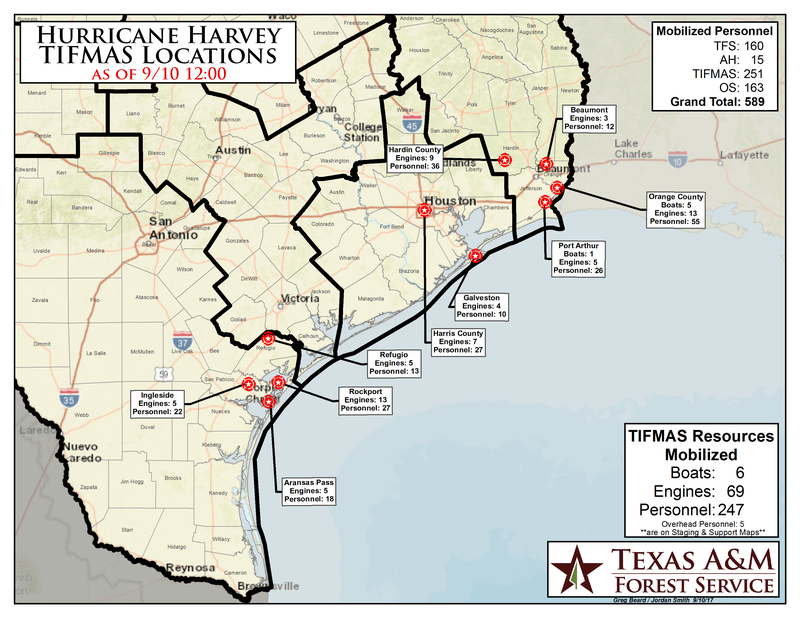 Texas A&M Forest Service has 212 emergency responders, including Texas all hazard incident management team members, positioned throughout Texas to help in hurricane response. View the current TFS Response map. They are currently positioned in Victoria, Corpus Christi, Ingleside, Rockport, Refugio, Pierce, Texas City, Lufkin, Austin, Houston, Richmond, Fort Bend, Dickenson, Seadrift, Woodsboro, Aransas Pass, Katy, Montgomery, Ford Park and Bryan-College Station. Through the Texas Intrastate Fire Mutual Aid System (TIFMAS), 426 firefighters have mobilized to Houston and other areas in the path of the storm. Since Friday, the Texas A&M Forest Service responded to 16 fires for 2148.1 acres. Yesterday, the Texas A&M Forest Service responded to 7 fires for 763.8 acres. Yesterday, the Texas A&M Forest Service responded to 2 fires for 7.6 acres. Yesterday, the Texas A&M Forest Service responded to 4 fires for 167 acres. Yesterday, the Texas A&M Forest Service responded to 3 fires for 14 acres. Since Friday, the Texas A&M Forest Service responded to 12 fires for 257.2 acres. Yesterday, the Texas A&M Forest Service responded to 1 fire for 7 acres. Yesterday, the Texas A&M Forest Service responded to 5 fires for 260 acres. Yesterday, the Texas A&M Forest Service responded to 1 fire for 60 acres. Yesterday, the Texas A&M Forest Service responded to 7 fires for 31.6 acres. Since Friday, the Texas A&M Forest Service responded to 14 fires for 244.9 acres. The Texas A&M Forest Service responded to 5 fires for 50.6 acres. The Texas A&M Forest Service responded to 7 fires for 105.5 acres. The Texas A&M Forest Service responded to 1 fires for 1 acre. Since Friday, Texas A&M Forest Service has responded to 17 fires for 608.3 acres, including a 300 acre fire in Starr County. Yesterday Texas A&M Forest Service responded to 2 fires for 5 acres. Yesterday Texas A&M Forest Service responded to 7 fires for 4,313.3 acres, including a 3,000 acre fire in Motley County and a 1,200 acre fire in Val Verde County. Yesterday Texas A&M Forest Service responded to three fires for 102.1 acres. Including the Double Mountain Fire in Haskell County for 100 acres, and the Shell Oil Field Fire in San Jacinto County for .1 acre. Since Friday Texas A&M Forest Service has responded to four fires for 310 acres, including a 300 acre fire in Stephens County. Yesterday Texas A&M Forest Service responded to one fire for one acre. Yesterday Texas A&M Forest Service responded to 5 fires for 139 acres; including Fire 6114 in Wood County for 39 acres, the Space Station Fire in Archer County for 53 acres and the County Road 133 Fire in Milam County for 45 acres. Yesterday Texas A&M Forest Service responded to three fires for 54 acres, including the Snake Road Fire in Randall County, 43 acres now 100% contained. Since Friday Texas A&M Forest Service has responded to seven fires for 338.9 acres, including a 325 acre fire in Frio County. Yesterday there were no requests for assistance from Texas A&M Forest Service. Yesterday Texas A&M Forest Service responded to 1 fire for 1 acre in Bowie County. Yesterday Texas A&M Forest Service responded to 1 fire for 50 acres in Palo Pinto County. Yesterday Texas A&M Forest Service responded to 1 fire for 800 acres in Jeff Davis County. Since Friday Texas A&M Forest Service responded to one fire for 350 acres in Kenedy County. Yesterday there were no requests for Texas A&M Forest Service or US Forest Service assistance on wildfires. Yesterday Texas A&M Forest Service responded to two fires for 21 acres. #6106 Fire in Franklin County, 4 acres, 100% contained. Doctor's Place Fire in Mason County, 17 acres, 100% contained. Texas A&M Forest Service responders continue to support response and recovery operations for recent severe weather and flooding across the state and concentrated in Fort Bend and Brazoria counties. Since Friday there have been no requests for Texas A&M Forest Service or US Forest Service assistance on wildfires. The Lone Star State Incident Management Team (LSS IMT) continues to operate the Base Camp – Resource Staging Area at the Fort Bend County Fairgrounds - Expo Center supporting DDC 16 Operations and DPS Region 2. The Lone Star State Incident Management Team from Texas A&M Forest Service deployed to Fort Bend County yesterday, providing resources in support of continued response to severe weather. The deployment was activated by the Texas Division of Emergency Management and includes 35 team members. The team is setting up a base camp for emergency responders involved in the flood response. The site is to serve as a staging area for resources. Texas A&M Forest Service also is supporting the Fort Bend County Office of Emergency Management Joint Information Center with public information officers, helping staff District Disaster Chair 16 at the Department of Public Safety office in Rosenburg and the State Operations Center in Austin. In addition to on-going local responses, Regional All-Hazard Incident Management Team members are working with Texas A&M Forest Service in Fort Bend and Brazoria counties. Since Friday Texas A&M Forest Service has responded to one fire for 47 acres in Schleicher County. The US Forest Service had no requests for assistance on wildfires. Yesterday Texas A&M Forest Service responded to one fire for 0.5 acres in Angelina County. The US Forest Service had no requests for assistance on wildfires. Yesterday Texas A&M Forest Service responded to one fire for .5 acres in Nacogdoches County. The US Forest Service had no requests for assistance on wildfires. Yesterday Texas A&M Forest Service responded to one fire for 8.2 acres in Tyler County. The US Forest Service had no requests for assistance on wildfires. Yesterday Texas A&M Forest Service responded to one fire for one acre in Upshur County. The US Forest Service had no requests for assistance on wildfires. Since Friday Texas A&M Forest Service has responded to two fires for 765.5 acres, including a 765 acre fire in Jeff Davis County. The US Forest Service responded to one fire for 0.5 acres in Angelina County. Yesterday Texas A&M Forest Service responded to one fire for one acre in Cass County. The US Forest Service had no requests for assistance on wildfires. Yesterday Texas A&M Forest Service responded to one fire for 10 acres in Houston County. The US Forest Service had no requests for assistance on wildfires. Since Friday Texas A&M Forest Service has responded to two fires for 3.1 acres. The US Forest Service had no requests for assistance on wildfires. Yesterday there were no requests for Texas A&M Forest Service assistance on wildfires. The US Forest Service responded to one fire for 0.1 acre in Houston County. Since Friday Texas A&M Forest Service responded to seven fires for 16.5 acres. The US Forest Service had no requests for assistance on wildfires. Yesterday Texas A&M Forest Service responded to four fires for 27 acres. The US Forest Service responded to one fire for 0.4 acres. Yesterday Texas A&M Forest Service responded to three fires for 8.5 acres. The US Forest Service responded to one fire for 44.1 acres in Walker County. Yesterday Texas A&M Forest Service responded to four fires for 25.7 acres. The US Forest Service had no requests for assistance on wildfires. Yesterday Texas A&M Forest Service responded to two fires for 16 acres. The US Forest Service had no requests for assistance on wildfires. Since Friday Texas A&M Forest Service has responded to three fires for 12.1 acres. The US Forest Service had no requests for assistance on wildfires. Yesterday Texas A&M Forest Service responded to one fire for two acres in Anderson County. The US Forest Service responded to one fire for 0.5 acres in Shelby County. Yesterday Texas A&M Forest Service responded to 4 fires for 481 acres, including a 418 acre fire in Randall County. The US Forest Service had no requests for assistance on wildfires. Since Friday Texas A&M Forest Service has responded to three fires for 205 acres. The US Forest Service had no requests for assistance on wildfires. I-40 Fire, Wheeler County – 15,174 acres 95 percent contained. Crutch Fire, Hutchinson, Roberts, Carson and Gray counties – 44,686 acres. 100 percent contained. Yesterday Texas A&M Forest Service responded to four fires for 54,699 acres. The US Forest Service had no requests for assistance on wildfires. I-40 Fire, Wheeler County – this fire has burned an estimated 10,000 acres in grassy fuels and is 75 percent contained. No losses have been reported. Crutch Fire, Carson Co. – this fire has burned 44,686 acres in Carson, Hutchinson, Roberts and Gray counties. The fire is currently 50 percent contained and has been burning in grass fuels. There is a reported 2 abandoned homes and 2 other structures lost. Arrington Fire, Gray Co. – this fire burned 10 acres and is now contained. This fire is located approximately 6 miles NW of Pampa, TX. Yesterday Texas A&M Forest Service responded to two fires for 105 acres. The US Forest Service had no requests for assistance on wildfires. Since Friday Texas A&M Forest Service has responded to six fires for 709 acres, including a 700-acre fire in Childress County. The US Forest Service had no requests for assistance on wildfires. Yesterday Texas A&M Forest Service responded to two fires for 10 acres. The US Forest Service had no requests for assistance on wildfires. Yesterday Texas A&M Forest Service responded to one fire for 860 acres in Hartley County. The US Forest Service had no requests for assistance on wildfires. Yesterday Texas A&M Forest Service responded to four fires for 18 acres. The US Forest Service had no requests for assistance on wildfires. Yesterday there were no requests for Texas A&M Forest Service or the US Forest Service assistance on wildfires. Yesterday Texas A&M Forest Service responded to one fire for 0.1 acres in Bastrop County. The US Forest Service had no requests for assistance on wildfires. Yesterday Texas A&M Forest Service responded to one fire for 14.6 acres in Angelina County. The US Forest Service had no requests for assistance on wildfires. Since Friday Texas A&M Forest Service has responded to 18 fires for 273.6 acres. The US Forest Service has responded to 3 fires for 73 acres. Yesterday Texas A&M Forest Service responded to 11 fires for 333.8 acres, including a 123 acre pine plantation fire in Hardin County. The US Forest Service responded to one fire for 6.9 acres in San Augustine County. Yesterday Texas A&M Forest Service responded to six fires for 89 acres. The US Forest Service had no requests for assistance on wildfires. Yesterday Texas A&M Forest Service responded to one fire for three acres in Cherokee County. The US Forest Service had no requests for assistance on wildfires. Yesterday Texas A&M Forest Service had no requests for assistance on wildfire. The US Forest Service responded to one fire for 100 acres in Wise County. Since Friday Texas A&M Forest Service has responded to six fires for 245.5 acres. The US Forest Service has responded to three fires for 27.1 acres. Yesterday Texas A&M Forest Service responded to 4 fires for 31.2 acres. The US Forest Service had no requests for assistance on wildfires. Yesterday Texas A&M Forest Service has responded to 1 fire for 700 acres. The US Forest Service responded to 1 fire for 0.5 acres. Since Friday Texas A&M Forest Service has responded to one fire for five acres. The US Forest Service had no requests for assistance on wildfires. Since Friday Texas A&M Forest Service has responded to six fires for 330.6 acres. The US Forest Service had no requests for assistance on wildfires. Yesterday Texas A&M Forest Service responded to 9 fires for 695.2 acres, including a 650 acre fire in Brooks County. The US Forest Service responded to 2 fires for 1.5 acres. Yesterday Texas A&M Forest Service responded to three fires for 378.7 acres, including a 365 acre fire in Childress County. The US Forest Service responded three fires for 129.2 acres. Yesterday Texas A&M Forest Service responded to 10 fires for 152.3 acres and the U.S. Forest Service responded to two fires for 1.8 acres. Yesterday Texas A&M Forest Service responded to two fires for 4.9 acres. The US Forest Service had no requests for assistance on wildfires. Yesterday Texas A&M Forest Service responded to four fires for 16.1 acres. The Estate Fire in Potter County is contained. The US Forest Service responded to one fire for 1,000 acres in Houston County and is 80 percent contained. Yesterday Texas A&M Forest Service responded to 10 fires for 1,902 acres, including a 350-acre fire in Webb Co. that is now contained and the 1200-acre Estate Fire in Potter Co. that threatened a subdivision. No homes were lost and the fire is 90% contained. There were no requests for assistance on National Forest land. Yesterday Texas A&M Forest Service responded to 4 fires for 236.4 acres, including one new large 200-acre fire in Taylor County. The US Forest Service had no requests for assistance on wildfires. Sears, Taylor Co. – This fire burned 200 acres and is 100% contained. 2 homes were threatened. A TFS taskforce and Air Attack responded. FM998, Hartley Co. – This fire has burned 3,987 acres and is now 100% contained. Carol Ranch, Knox Co. – This fire has burned 2,125 acres and is now 100% contained. Jim Ned Road, Montague Co. – This fire has burned 330 acres and is now 95% contained. Yesterday Texas A&M Forest Service responded to 8 fires for 946.2 acres, including one new large 866 acre fire in Jim Wells County. The US Forest Service responded to 3 fires for 68 acres. CR440, Jim Wells Co. – This fire has burned 866 acres and is 90 percent contained. No threats were reported. FM998, Hartley Co. – This fire has burned 3,987 acres and is 90 percent contained. There were 85 previously homes threatened, currently five are threatened. Some evacuations did occur initially, those evacuated have returned home. Two TFS task forces responded. Carol Ranch, Knox Co. – This fire has burned 2,125 acres and is 60 percent contained. No threats reported. A TFS task force responded. Jim Ned Road, Montague Co. – This fire has burned 330 acres and is 95 percent contained. No threats reported. A TFS task force responded. Yesterday Texas A&M Forest Service responded to 10 fires for 6,078.2 acres, including 3 new large fires. The US Forest Service had no requests for assistance on wildfires. FM998, Hartley Co. – This fire has burned 3,985 acres and is 90 percent contained. There were 85 homes threatened and some evacuations did occur. Two TFS task forces responded. Carol Ranch, Knox Co. – This fire has burned 1,700 acres and is 25 percent contained. No threats identified. A TFS task force responded. Jim Ned Road, Montague Co. – This fire has burned 330 acres and is 40 percent contained. No threats identified. A TFS task force responded. Yesterday Texas A&M Forest Service responded to 8 fires for 578.5 acres, including a 151 acre fire in Red River County and a 325.8 acre fire in Victoria County. The US Forest Service responded to 2 fires for 0.8 acres. Yesterday Texas A&M Forest Service responded to 36 fires for 252.3 acres. The US Forest Service responded to six fires for 7.3 acres. Since Friday Texas A&M Forest Service has responded to 12 fires for 505.9 acres, including a 380 acre fire in Concho County. The US Forest Service responded to one fire for 15 acres in Walker County. Yesterday Texas A&M Forest Service responded to two fires for 25 acres. The US Forest Service had no requests for assistance on wildfires. Yesterday Texas A&M Forest Service responded to four fires for 312.5 acres, including a 300 acre fire in Hall County. The US Forest Service responded to one fire for 0.1 acres in Walker County. Yesterday Texas A&M Forest Service responded to 13 fires for 82.2 acres. The US Forest Service had no requests for assistance on wildfires. Yesterday Texas A&M Forest Service responded to two fires for 201 acres. The US Forest Service had no requests for assistance on wildfires. Since Friday, Texas A&M Forest Service has responded to 23 fires for 2,743.2 acres. Large fires include a 1,750 acre fire in Potter County and a 642 acre fire in Callahan County. The US Forest Service responded to one fire for 1.8 acres. River Fire acreage updated to 1,475 acres and 30 percent contained. TFS dozers are working to put a fire line around the fire. High Line Fire acreage updated to 700 acres and is 25 percent contained. River Fire is burning in heavy fuels approximately 12 miles north of Amarillo. Extreme fire behavior reported and crews are actively protecting structures. Yesterday Texas A&M Forest Service responded to 6 fires for 97 acres. The US Forest Service had no requests for assistance on wildfires. TFS assisted US Fish and Wildlife with a 200 acre fire in Austin County. Yesterday Texas A&M Forest Service responded to two fires for 15.1 acres. The US Forest Service had no requests for wildfire assistance. Since Friday Texas A&M Forest Service has responded to four fires for 251 acres. The US Forest Service had no requests for assistance on wildfires. Yesterday Texas A&M Forest Service responded to one fire for 293 acres. The US Forest Service had no requests for assistance on wildfires. Yesterday Texas A&M Forest Service responded to four fires for 250 acres. The US Forest Service had no requests for assistance on wildfires. Since Friday Texas A&M Forest Service has responded to three fires for five acres. The US Forest Service had no requests for assistance on wildfires. Since Friday there were no requests for Texas A&M Forest Service or US Forest Service assistance on wildfires. Yesterday the Texas A&M Forest Service had no requests for assistance on wildfires. The US Forest Service responded to one fire for 0.3 acres in Wise County. Since Dec. 23, Texas A&M Forest Service has responded to four fires for 314 acres. The US Forest Service had no requests for assistance on wildfires. Yesterday Texas A&M Forest Service responded to two fires for nine acres. The US Forest Service had no requests for assistance on wildfires. Since Friday Texas A&M Forest Service has responded to two fires for 505 acres, including a 500 acre fire in Hutchinson County. The US Forest Service had no requests for assistance on wildfires. Since Friday Texas A&M Forest Service has responded to one fire for one acre in Sabine County. The US Forest Service had no requests for assistance on wildfires. Yesterday Texas A&M Forest Service responded to two fires for 48 acres. The US Forest Service had no requests for assistance on wildfires. Yesterday Texas A&M Forest Service responded to one fire for 250 acres in Carson County. The US Forest Service had no requests for assistance on wildfires. Yesterday Texas A&M Forest Service responded to one fire for 200 acres in Armstrong County. The US Forest Service had no requests for assistance on wildfires. Since Wednesday Texas A&M Forest Service responded to one fire for one acre in Walker County. The US Forest Service had no requests for assistance on wildfires. Yesterday Texas A&M Forest Service responded to one fire for five acres in Bowie County. The US Forest Service had no requests for assistance on wildfires. Since Friday Texas A&M Forest Service has responded to 4 fires for 3,062 acres, including a 2,819 acre fire in Carson County. The US Forest Service had no requests for assistance. Elevated fire danger is expected in the Panhandle Monday and Tuesday due to above normal temperatures and low relative humidity. According to the National Weather Service, southwest winds will sustain at 15 – 20 mph, with gusts up to 25 mph. Affected counties include Armstrong, Carson, Dallam, Deaf Smith, Hansford, Hartley, Hutchinson, Moore, Oldham, Potter, Randall and Sherman. The state investigation for The Hidden Pines Fire has closed. The cause of the fire was ruled accidental by equipment use. According to the National Weather Service, a dry cold front will approach and cross the West Texas Plains over the next two days bringing strong winds in advance of and following the frontal passage. Affected areas include Amarillo, Lubbock and Midland. Visit http://www.srh.noaa.gov/ridge2/fire/ see fire weather forecasts in your area. Yesterday Texas A&M Forest Service responded to two fires for 17 acres. The US Forest Service had no requests for wildfire assistance. Yesterday the Texas A&M Forest Service responded to 1 new fires for .3 acres. The US Forest Service had no requests for wildfire assistance. Yesterday there were no requests for Texas A&M Forest Service. Since Friday there have been no requests for Texas A&M Forest Service or US Forest Service for wildfire assistance. Hidden Pines, Bastrop County – 4,582 acres, and contained. There have been 64 homes lost, 95 homes threatened, 77 misc structures lost and 15 misc structures threatened. TFS resources, a Type 1 incident management team, TIFMAS Wildland Engine Strike Teams and Structure Protection Strike Teams responded and have demobilized. The Unified Commanders of the Hidden Pines Fine are pleased to announce that the wildfire is 100% contained and under control. The Bastrop County Office of Emergency Management and other county officials are now completely engaged with recovery operations for our families, neighborhoods and ecosystems. Bastrop County Judge Paul Pape said "With the widespread rainfall, we have finally declared the Hidden Pines fire contained. I am grateful to our Incident Command and the hundreds of men and women who valiantly fought to protect life and property. Now the long, difficult recovery can begin in earnest." Sheriff Pickering would like to thank our law enforcement partner agencies for this event. Their assistance and teamwork were invaluable to the safety and security of the community. Yesterday Texas A&M Forest Service responded to 11 new fires for 42 acres. The US Forest Service had no requests for wildfire assistance. Hidden Pines, Bastrop County – 4,582 acres, 85 percent contained. There have been 64 homes lost, 95 homes threatened, 77 misc structures lost and 15 misc structures threatened. In addition to TFS resources, a Type 1 incident management team, TIFMAS Wildland Engine Strike Teams and Structure Protection Strike Teams are currently assigned. The Hidden Pines Fire is being managed by the Southern Area Blue Team and continued to hold acreage steady with 4582 acres. Patrol and Mop-up operations, particularly near structures, are the major operations today. This involves cooling, digging, sawing/chopping the fuels, and using water from hose lays and engines to completely extinguish these hotspots. Snags continue to be a concern as they fall, posing threats to the constructed lines and to the firefighters themselves. Assessments of hazard trees will continue. Airtankers are on standby, but have not been used for several days. Weather Conditions today: Cloudy, with a 30% chance of showers and storms. Temperatures will range 81-83 degrees, Minimum Relative Humidity ranging 64-68% and winds SE 12-16 mph, gusty in the afternoon. The chance of wetting rain is 80% (where rainfall is over 0.1”). Texas A&M Forest Service has not yet announced its final conclusion of the cause of the fire and continues to be under investigation. Yesterday Texas A&M Forest Service responded to 4 new fires for 4 acres. The US Forest Service had no requests for wildfire assistance. Hidden Pines, Bastrop County – 4,582 acres, 80 percent contained. There have been 64 homes lost, 95 homes threatened, 77 misc structures lost and 15 misc structures threatened. In addition to TFS resources, a Type 1 incident management team, TIFMAS Wildland Engine Strike Teams and Structure Protection Strike Teams are currently assigned. Fuller, Stephens County – 1,700 acres and now contained. One home was lost, residences were evacuated. Two Blackhawks, four single engine airtankers, an aerial supervision platform, CL-415 scooper airtanker, seven TFS dozers, one TFS engine and a TIFMAS Wildland Engine Strike Team responded. Yesterday Texas A&M Forest Service responded to 8 new fires for 166 acres. • Fuller Fire, Stephens County – 1,000 acres and 90 percent contained. One home was lost, residences were evacuated. Two Blackhawks, four single engine airtankers, an aerial supervision platform, CL-415 scooper airtanker, seven TFS dozers, one TFS engine and a TIFMAS Wildland Engine Strike Team responded. • Hidden Pines Fire, Bastrop County – 4,582 acres, 80 percent contained. There have been 64 homes lost, 95 homes threatened, 77 misc structures lost and 15 misc structures threatened. In addition to TFS resources, a Type 1 incident management team, TIFMAS Wildland Engine Strike Teams and Structure Protection Strike Teams are currently assigned. The Hidden Pines Fire is being managed by the Southern Area Blue Team and continued to hold acreage steady with 4582 acres. Large heavy fuels continue to burn in the interior of the fire, with some stumps being completely burned into the ground. Mop-up operations, particularly near structures, are the major operations today. This involves cooling, digging, sawing/chopping the fuels, and using water from hose lays and engines to completely extinguish these hotspots. Snags continue to be a concern as they fall, posing threats to the constructed lines and to the firefighters themselves. Helicopters continue to support mop-up operations. Air tankers are on standby, but have not been used for several days. Weather Conditions today: temperatures up to 87 degrees, Minimum Relative Humidity ranging 39-42% and winds SE 8-12 mph. Yesterday Texas A&M Forest Service responded to 16 new fires for 1,971 acres. North Side, Walker County – 600 acres and now contained. Two homes were lost and an additional 50 threatened, 14 misc structures were lost. Three Type 1 helicopters, two heavy airtankers, a very large airtanker, an aerial supervision platform, a lead plane, six TFS dozers, two USFS dozers, and two TIFMAS Strike Teams responded. Fuller, Stephens County – 1,000 acres and 50 percent contained. One home was lost, residences were evacuated. Two Blackhawks, four single engine airtankers,an aerial supervision platform, CL-415 scooper airtanker, seven TFS dozers, one TFS engine and a TIFMAS Wildland Engine Strike Team responded. Hidden Pines, Bastrop County – 4,582 acres, 70 percent contained. There have been 68 homes lost, 95 homes threatened, 77 misc structures lost and 15 misc structures threatened. In addition to TFS resources, a Type 1 incident management team, TIFMAS Wildland Engine Strike Teams and Structure Protection Strike Teams are currently assigned. Hunter Road, Robertson County – 230 acres and now contained. Two homes were threatened and saved. A TFS supervisor and TIFMAS Wildland Engine Strike Team responded. Rimrock Ranch, Crockett County – 350 acres and now contained. Crews continue to put in line and will continue throughout the night. Relief Task forces from Lubbock and Wichita Falls will arrive in the morning. The fire progression was stopped about 3 miles south of the City of Breckenridge. Aircraft will be requested back on the fire in the morning. North Side Fire is currently 600 acres and 80% contained. Post Fire Assessment Team will meet tomorrow to assess structure loss. Fuller Fire is estimated at 1,000 acres and is 5% contained. DPS and Sheriff’s Office are assisting with selective evacuations at this time. ACRFC Cooper and IC Abernathy have transitioned the Incident to TYPE 3 with Abernathy as IC. The Hidden Pines Fire is being managed by the Southern Area Blue Team and continued to hold acreage steady with 4582 acres. Minor spots over the fire lines were immediately contained and cooled with hose lays and bucket drops with Blackhawk helicopters. Large heavy fuels continue to burn in the interior of the fire, with some stumps being completely burned into the ground. Snags continue to be a concern as they fall, posing threats to the constructed lines and to the firefighters themselves. Firefighters are continuing to go with direct lines when fire intensity allows. Crews are mopping-up along the perimeter, cooling heat sources with hose lays. Weather Conditions today: temperatures up to 85 degrees, Minimum Relative Humidity ranging 19-21% and winds SE 6-10 mph. The Hidden Pines Fire is being managed by the Blue Team and continued to hold acreage steady with 4582 acres. Minor spots over the fire lines were immediately contained and cooled with hose lays and bucket drops with Chinook helicopters. Large heavy fuels continue to burn in the interior of the fire, with some stumps being completely burned into the ground. Snags continue to be a concern as they fall, posing threats to the constructed lines and to the firefighters themselves. Firefighters are continuing to go with direct lines when fire intensity allows. Weather Conditions today: temperatures up to 85 degrees, Minimum Relative Humidity down to as low as 14% and winds ESE 6-10 mph. Hidden Pines, Bastrop County – 4,582 acres, 40 percent contained, 154 homes threatened. A Type 1 incident management team, Texas Intrastate Fire Mutual Aid System is responding with Wildland Engine Strike Teams and Structure Protection Strike Teams. Hidden Pines Fire is currently 4,582 acres and 25% contained. Northeast winds will prevail at 8 - 12 mph. Around 2 - 4 p.m. is when winds are expected to be at their highest. Fire behavior is slow, with a chance of high significant fire potential. Four consecutive days of accelerated drying for North, East and Central Texas has increased the amount of critically dry fuels. Wind speeds today increase the significant fire potential. Where critically dry conditions exist in parts of Northeast and parts of Central Texas the significant fire potential is high to very high. Winds are expected to be their strongest during the morning hours and begin to relax going into the afternoon. Strongest winds will be the Panhandle, Southern Plains and out in West Texas. Wind speeds will also be a concern in East Texas, any speed above 10 mph can be enough to take a surface fire into the tree canopy. Through the weekend, dry air will persist and could increase the fire potential. The current front will reinforce the dry air for Central, North and Northeast Texas for the entire weekend sending RH back into the teens. Yesterday Texas A&M Forest Service responded to 18 fires for 818 acres, including two new large fires. Hidden Pines, Bastrop County – 4,383 acres, 25 percent contained, nine homes lost, 154 threatened. A Type 1 incident management team has been ordered and should arrive today. TIFMAS Wildland Engine Strike Teams and Structure Protection Strike Teams have arrived. Whitley, Brown County – 300 acres, 15 percent contained, 12 homes threatened. Tank Battery Fire, Anderson County – 125 acres and now contained, this fire was burning in forested area. Preston Ranch, Menard County – 860 acres and contained. Taylor Road, Clay County – 380 acres and contained, 12 homes were threatened. Union Hill, Ellis County – 320 acres and contained, three homes were threatened. The US Forest Service had no requests for wildfire assistance. Hidden Pines, Bastrop County – 4,200 acres, 15 percent contained, nine homes lost, 154 threatened. A Type 1 incident management team is being ordered. Taylor Road, Clay County – 400 acres, 90 percent contained, 12 homes threatened. Union Hill, Ellis County – 350 acres, 60 percent contained, three homes threatened. Preston Ranch, Menard County – 1,000 acres, 95 percent contained. Fire is currently at 3,500 acres, still 10% contained with very active fire behavior. Nine homes confirmed lost, three saved. Containment remains at 10%. 1,000-acre Preston Ranch Fire in Menard County is now 5% contained. Due to extreme fire behavior and topography challenges, the containment of the Hidden Pines Fire has dropped to 10%. If you have concerns about the threat of wildfire smoke visit Texas Department of State Health Services for a complete list of symptoms and safety measures. Smoke can pose a serious health threat. Children and older adults are also at greater risk. Even healthy people can be affected by smoky conditions. Smoke from wildfires can hurt your eyes, irritate your respiratory system and worsen symptoms from pre-existing conditions. The Hidden Pines Fire is now 1,512 acres and 50% contained. Additional resources were requested, including a TIFMAS strike team and task force, and a Type 3 IMT. Continue to follow the Hidden Pines Fire event page and Dispatch Tracker for updates. Evacuees are encouraged to follow updates from the media and on the Bastrop County Office of Emergency Management Facebook page. If social media is not available, evacuees may go to the Incident Command Post located at the Buescher State Park Refectory for information. Residents must show proof of ID and residency to enter the park, and the may enter through the main entrance gate for Buescher State Park. For information regarding evacuation, donation and shelters please follow Bastrop County Office of Emergency Management on Facebook or join their Hidden Pines Fire event page. The Hidden Pines Fire is now 375 acres and is 50% contained. Yesterday Texas A&M Forest Service responded to 24 fires for 971 acres, including a 275-acre fire in Bastrop County. That fire is now 40 percent contained. Nine homes and the MD Anderson Research facility were saved. Four SEATs worked the fire yesterday and two National Guard Blackhawk helicopters have been requested for today. Tuesday, Oct. 13, 11:16 a.m. Yesterday Texas A&M Forest Service responded to 11 fires for 87 acres. There were no requests for U.S. Forest Service assistance. Monday, Oct. 12, 10:35 a.m. Yesterday Texas A&M Forest Service responded to 14 fires for 278 acres. There were no requests for U.S. Forest Service assistance. Yesterday Texas A&M Forest Service responded to five fires for 13 acres. There were no requests for U.S. Forest Service assistance. Yesterday Texas A&M Forest Service responded to five fires for 40 acres. There were no requests for U.S. Forest Service assistance. Yesterday Texas A&M Forest Service responded to four fires for 105 acres. There were no requests for U.S. Forest Service assistance yesterday. Yesterday Texas A&M Forest Service responded to four fire for 2,398 acres. There was one large fire in Schleicher County that burned 2,250 acres but is now contained. Yesterday Texas A&M Forest Service responded to five fires for 23 acres. There were no requests for U.S. Forest Service assistance on wildfires. Yesterday Texas A&M Forest Service responded to two fires for 46 acres in East Texas. There were no requests for U.S. Forest Service assistance. Yesterday Texas A&M Forest Service responded to eight fires for 85 acres. The US Forest Service had no requests for wildfire assistance. Yesterday Texas A&M Forest Service responded to four fires for 305 acres, including a [ektdesignns_placeholder_ID0E4CAC]fire in Archer County and a 120 acre fire in Concho County. The US Forest Service had no requests for wildfire assistance. Yesterday Texas A&M Forest Service responded to five fires for 412 acres, including a 350 acre fire in Jack County. The US Forest Service had no requests for wildfire assistance. Yesterday Texas A&M Forest Service responded to 1 fire for 36 acres in Bastrop County. The US Forest Service had no requests for wildfire assistance. Yesterday Texas A&M Forest Service responded to three fires for 94 acres. The US Forest Service had no requests for assistance. Yesterday Texas A&M Forest Service responded to three fires for 1,247 acres, including a 1,000 acre fire in Scurry County. The US Forest Service had no requests for assistance. Yesterday Texas A&M Forest Service responded to 4 fires for 151 acres. The US Forest Service had no requests for wildfire assistance. Yesterday Texas A&M Forest Service responded to two fires for 214 acres. The US Forest Service had no requests for wildfire assistance. Yesterday Texas A&M Forest Service responded to 17 fires for 787 acres. The largest is a 700-acre fire in Sutton County to which TFS resources are in route at this time. Yesterday Texas A&M Forest Service responded to five fires for 164 acres. There were no requests for U.S. Forest Service assistance. Yesterday Texas A&M Forest Service responded to four fires for 26 acres. The US Forest Service responded to one fire for 120 acres in San Jacinto County. Yesterday Texas A&M Forest Service responded to 10 fires for 247 acres. The US Forest Service had no requests for wildfire assistance. Yesterday Texas A&M Forest Service responded to 10 fires for 27.16 acres. The US Forest Service had no requests for wildfire assistance. Yesterday Texas A&M Forest Service responded to 6 fires for 56.4 acres. The US Forest Service had no requests for wildfire assistance. Yesterday Texas A&M Forest Service responded to six fires for 58 acres. There were no requests for U.S. Forest Service assistance. Yesterday Texas A&M Forest Service responded to five fires for 118 acres. There were no requests for U.S. Forest Service assistance. Yesterday Texas A&M Forest Service responded to two fires for 155 acres. There were no requests for U.S. Forest Service assistance. Yesterday Texas A&M Forest Service responded to nine fires for 80 acres.There were no requests for U.S. Forest Service assistance. Yesterday Texas A&M Forest Service responded to two fires for three acres in Northeast Texas. There were no requests for U.S. Forest Service assistance. Yesterday Texas A&M Forest Service responded to four fires for 410 acres, including one large fire in Scurry County. The Calley Ranch Fire is 384 acres and 80% contained. Yesterday Texas A&M Forest Service responded to 11 new fires for 1906.06 acres, including two large fires in Clay and Hardeman counties. The US Forest Service had no requests for wildfire assistance. Barry Fire in Clay County, approx. 10 miles south of Windthorst, has burned 1,400 acres and is 30 percent contained. Twenty homes and 20 other misc. buildings are threatened; two unoccupied homes and misc. wind turbine equipment were destroyed. TFS responded with six dozers, an engine, two single engine airtankers and an air attack platform. Hale Fire in Hardeman County, 2 miles north of Acme, has burned 400 acres and is now contained. One barn was lost, no other threats reported. TFS responded with a dozer, motor grader, and an engine. Boyd Fire in Atascosa County, 1 mile south of Natalia, has burned 371 acres and is 90 percent contained. TFS responded with two dozers, anengine and an air attack platform. Buckle L3 Fire in Childress County, approx. 9 miles south of Childress, burned 300 acres and is now contained. Abernathy Fire in Hardeman County, approx. 5 miles northwest of Quanah, burned 800 acres and is now contained. Since Friday Texas A&M Forest Service has responded to 26 fires for 1,587.08 acres, including three large fires in Childress, Hardeman and Atascosa counties. The largest fire being in Hardeman County at 800 acres, 75% contained. The US Forest Service requested assistance on one fire in San Jacinto County. Yesterday Texas A&M Forest Service responded to two fires for seven acres. Yesterday Texas A&M Forest Service responded to three fires for 102 acres. The US Forest Service had no requests for wildfire assistance. TFS had an additional request assistance in Taylor County but was cancelled. Yesterday Texas A&M Forest Service responded to five fires for 23 acres. The US Forest Service had no requests for wildfire assistance. Yesterday Texas A&M Forest Service responded to five fires for 24 acres. There were no requests for U.S. Forest Service assistance on wildfires. Yesterday Texas A&M Forest Service responded to two fires for 20.76 acres. The US Forest Service had no requests for wildfire assistance. Yesterday Texas A&M Forest Service responded to four fires for 161.5 acres. The US Forest Service had no requests for wildfire assistance. Yesterday Texas A&M Forest Service responded to 1 fire for 5 acres in San Augustine County. The US Forest Service had no requests for wildfire assistance. TFS received a late evening request for assistance on an additional fire in La Salle County but were canceled in route. Yesterday Texas A&M Forest Service responded to two new fires for 35 acres. The US Forest Service had no requests for wildfire assistance. Yesterday Texas A&M Forest Service responded to 3 new fires for 2,241.72 acres, including a large fire in Shackelford County. The US Forest Service had no requests for wildfire assistance. Chimney Creek Two fire in Shackelford County, approx. 14.5 miles west of Albany is estimated at 2,200 acres and 80 percent contained. One outbuilding was threatened, no losses reported. TFS responded with 5 dozers, 1 engine, 4 single engine airtankers and an air attack platform. Corner Pasture fire in Kerr County, approx. 21 miles SE of Junction is estimated at 210 acres and 95 percent contained. The fire experienced a 10 acre slop-over yesterday. TFS responded with 3 dozers, an engine, 4 single engine airtankers, a type 3 helicopter and an air attack platform. Yesterday Texas A&M Forest Service responded to two new fires for 1.26 acres. The US Forest Service had no requests for wildfire assistance. Corner Pasture fire in Kerr County, approx. 21 miles SE of Junction is estimated at 200 acres and contained. The Eaton Cemetery fire in Mason County, approx. 12 miles E of Mason is estimated at 10,468 acres and contained. Yesterday Texas A&M Forest Service responded to nine new fires for 302.86 acres, including a large fire in Kerr County. The US Forest Service had no requests for wildfire assistance. Corner Pasture fire in Kerr County, approx. 21 miles SE of Junction is estimated at 200 acres and 10 percent contained. TFS responded with 2 dozers, an engine, a type 3 helicopter and three single engineairtankers. One home is threatened, no reported losses. The Eaton Cemetery fire in Mason County, approx. 12 miles E of Mason is estimated at 10,468 acres and 98 percent contained. TFS responded with 5 dozers, 4 engines, a TIFMAS engine strike team, 6 helicopters, 3 single engine airtankers and an air attack platform. There are 23 homes and 10 misc buildings threatened, 3 homes were directly saved. No reported losses. The Buckholt fire in Crockett County, approx. 25 miles SW of Ozona is estimated at 1,000 acres and is now contained. Yesterday Texas A&M Forest Service responded to two new fires for 138 acres, including a large fire in Houston County. The US Forest Service had no requests for wildfire assistance. The Glasscock fire in Houston County, approx. 11 miles WNW of Apple Springs is estimated at 123 acres and is now contained. This fire was burning in forested area and three homes were saved. The Eaton Cemetery fire in Mason County, approx. 12 miles E of Mason is estimated at 7,856 acres and 95 percent contained. TFS responded with 5 dozers, 4 engines, a TIFMAS engine strike team, 6 helicopters, 3 single engine airtankers and an air attack platform. There are 23 homes and 10 misc buildings threatened, 3 homes were directly saved. No reported losses. The Buckholt fire in Crockett County, approx. 25 miles SW of Ozona is estimated at 1,000 acres and 80 percent contained. TFS responded with 4 dozers, 2 engines, motor grader and an air attack platform. The Prickley Pear fire in Crockett County, approx. 21 miles SW of Ozona is estimated at 3,452 acres and now contained. The White Ranch fire in Pecos County, approx. 8 miles SE of Sheffield is estimated at 2,500 acres and now contained. Yesterday Texas A&M Forest Service responded to 6 new fires for 2,516.8 acres, including a large fire in Pecos County. The US Forest Service had no requests for wildfire assistance. The Eaton Cemetery fire in Mason County, approx. 12 miles E of Mason is estimated at 7,856 acres and 65 percent contained. TFS responded with 5 dozers, 4 engines, a TIFMAS engine strike team, 6 helicopters, 3 single engine airtankers and an air attack platform. There are 23 homes and 10 misc buildings threatened, 3 homes were directly saved. No reported losses. The White Ranch fire in Pecos County, approx. 8 miles SE of Sheffield is estimated at 2,500 acres and 55 percent contained. A TFS fire supervisor flew this fire with a DPS helicopter and provided a size-up to VFD’s on scene. This fire received some light rain yesterday afternoon. A TFS task force is on stand-by in Ozona if additional assistance is requested. The Prickley Pear fire in Crockett County, approx. 21 miles SW of Ozona is estimated at 3,452 acres and 90 percent contained. TFS responded with 5 dozers, 2 engines and a TIFMAS engine strike team. No threats are identified at this time. The Willabee fire in Schleicher County, approx. 8 miles SW of Eldorado is estimated at 400 acres and is now contained. Yesterday Texas A&M Forest Service responded to 7 new fires for 12, 551 acres, including large fires in Schleicher and Crockett counties. The US Forest Service had no requests for wildfire assistance. The Prickley Pear fire in Crockett County, approx. 21 miles SW of Ozona is estimated at 12,000 acres and 2 percent contained. TFS responded yesterday evening with 5 dozers and 2 engines. No threats are identified at this time. A TIFMAS engine strike team has been ordered to arrive today. The Willabee fire in Schleicher County, approx. 8 miles SW of Eldorado is estimated at 300 acres and 60 percent contained. TFS responded late evening with 2 dozers and an engine. There are 4 homes threatened and 1 barn, no reported losses. The Eaton Cemetery fire in Mason County, approx. 12 miles E of Mason is estimated at 3,000 acres and 30 percent contained. TFS responded with 5 dozers, 4 engines, 4 helicopters, 2 single engine airtankers and an air attack platform. There are 23 homes and 10 misc buildings threatened, 3 homes were directly saved. No reported losses. A TIFMAS engine strike team was ordered yesterday and traveled last night. The Rocking Chair fire in Tom Green County, approx. 29 miles SE of San Angelo is 425 acres and is now contained. Yesterday Texas A&M Forest Service responded to 8 new fires for 1, 570.32 acres, including large fires in Tom Green and Crockett counties. The US Forest Service had no requests for wildfire assistance. The Rocking Chair fire in Tom Green County, approx. 29 miles SE of San Angelo is 425 acres and 95 percent contained. TFS responded with 3 dozers and 1 engine. This fire is burning in brush and there are no current threats identified. The Buckholt fire in Crockett County, approx. 25 miles SW of Ozona is estimated at 1,000 acres and 25 percent contained. TFS responded with 4 dozers, 2 engines and an air attack platform. Yesterday Texas A&M Forest Service responded to four new fires for 66 acres. The US Forest Service had no requests for wildfire assistance. The MK fire in Kerr County, approx. 33 miles west of Kerrville, is 1,300 acres and is now contained. The Morgan Road fire in McLennan County, approx. 5 miles northwest of Crawford, is 349.5 acres and is now contained. The Brooks fire in McCulloch County, approx. 10 miles southeast of Brady, is 300 acres and is now contained. The San Ygnacio fire in Zapata County, approx. 10 miles east of San Ygnacio, is 1,000 acres and is now contained. Yesterday Texas A&M Forest Service responded to eight fires for 1,933.5 acres, including four large new fires. The US Forest Service had no requests for wildfire assistance. The MK fire in Kerr County, approx. 33 miles west of Kerrville, is 1,300 acres and is currently 95% contained. The Reilly Ranch Road fire in Polk County, approx. 4 miles west of Corrigan, is 105 acres and is currently 100% contained. TFS responded with 4 dozers. This fire was burning in 6 and 12-year-old pine plantations and the cause is lightning. The Morgan Road fire in McLennan County, approx. 5 miles northwest of Crawford, is 349.5 acres and is currently 90% contained. TFS responded with one dozer, two engines, and a motor grader. The Brooks fire in McCulloch County, approx. 10 miles southeast of Brady, is 300 acres and is currently 80% contained. TFS responded with two dozers and one engine. The San Ygnacio fire in Zapata County, approx. 10 miles east of San Ygnacio, is 1,000 acres and is currently 70% contained. Yesterday Texas A&M Forest Service responded to 4 fires for 15 acres. The US Forest Service had no requests for wildfire assistance. The MK Fire in Kerr County, approx. 33 miles west of Kerrville, is 1,300 acres and is currently 75% contained. Yesterday Texas A&M Forest Service responded to 4 fires for 2,021 acres, including a 2,000 acre fire in Kerr County. The US Forest Service had no requests for wildfire assistance. The MK Fire in Kerr County, approx. 33 miles west of Kerrville, is 2,000 acres and is currently 40% contained. Eight homes were threatened as of last night. Yesterday Texas A&M Forest Service responded to 1 new fire for 500 acres fire in Menard County. The US Forest Service had no requests for wildfire assistance. The Treadwell Lane Fire in Menard County, approx. 18 miles west of Menard, is currently estimated at 657 acres and 95 percent contained. 2 fire supervisors, 3 engines, and 6 dozers responded yesterday. The Wilhelm Lane Fire in Menard County, approx. 14 miles northwest of Menard is estimated at 500 acres and 25% contained. Yesterday 2 fire supervisors, 2 dozers, and an engine responded. The Cox Ranch Fire in Crockett County, approx. 19 miles West of Ozona, is currently 432.80 acres and now contained. Yesterday Texas A&M Forest Service responded to 5 fires for 1,026.25 acres, including a new 800 acre fire in Menard County. The US Forest Service had no requests for wildfire assistance. The Treadwell Lane Fire in Menard County, approx. 18 miles west of Menard, is currently estimated at 800 acres and 50 percent contained. A TFS fire supervisor, an engine and 2 dozers responded late yesterday evening. An additional TFS task force is enroute this morning. The Cox Ranch Fire in Crockett County, approx. 19 miles West of Ozona, is currently 432.80 acres and 90 percent contained. TFS dozers and an engine, along with TIFMAS engines are continuing to work this fire. One home was threatened. The West Fire in Crockett County, approx. 11 miles northwest of Juno, is currently 3,000 acres and is now contained. Yesterday Texas A&M Forest Service responded to 7 fires for 442.8 acres, including a new 410 acre fire in Mason County. The US Forest Service had no requests for wildfire assistance. The L Bar Fire in Llano County, approx. 10 miles east of Llano, is currently 410 acres and is now contained. A TFS fire supervisor responded. The Sutton Ranch Fire in Crockett County, approx. 11 east of Sheffield, is currently 693 acres and is now contained. The Head of the River Ranch Fire in Tom Green County, approx. 7 miles South of Christoval, is 5,240 acres and is now contained. The West Fire in Crockett County, approx. 11 miles northwest of Juno, is currently 3,000 acres and 80 percent contained. There are TFS fire supervisors and dozers staffing this fire. No threats identified at this time. Yesterday Texas A&M Forest Service responded to 6 fires for 30.36 acres. The US Forest Service had no requests for wildfire assistance. The Sutton Ranch Fire in Crockett County, approx. 11 east of Sheffield, is currently 693 acres and 90 percent contained. TFS resources continue to work and monitor this fire. No threats identified at this time. The West Fire in Crockett County, approx. 11 miles northwest of Juno, is currently 3,000 acres and 50 percent contained. There are TFS fire supervisors and dozers staffing this fire. No threats identified at this time. The Head of the River Ranch Fire in Tom Green County, approx. 7 miles South of Christoval, is 5,240 acres and 90 percent contained. There were 25 homes threatened and an evacuation notice was issued. Resources responding include TFS fire supervisors,dozers and TIFMAS engine strike teams. Yesterday Texas A&M Forest Service responded to 9 fires for 503.08 acres, including a 300-acre fire in Young. The US Forest Service had no requests for wildfire assistance. The Brown Ranch Complex in Edwards County, approx. 12 miles west of Rocksprings, is 17,831 acres and was contained yesterday evening. The Sutton Ranch Fire in Crockett County, approx. 11 east of Sheffield, is currently 693 acres and 75 percent contained. TFS resources continue to work and monitor this fire. No threats identified at this time. The Head of the River Ranch Fire in Tom Green County, approx. 7 miles South of Christoval, is 5,500 acres and 50 percent contained. There are 25 homes threatened and an evacuation notice was issued. Resources responding include TFS fire supervisors,dozers and TIFMAS engine strike teams. Fireline construction continues, yesterday additional containment issues were caused by dust devils carrying embers across the lines. The Upper Tonk Fire in Young County, approx. 7 miles SW of Graham, is currently 300 acres and 55 percent contained. TFS fire supervisors and dozers responded early afternoon to this request. Two homes were threatened and one miscellaneous was lost. Yesterday Texas A&M Forest Service responded to five new fires for 163.85 acres. The US Forest Service had no requests for assistance. The Brown Ranch Complex in Edwards County is 16,521 acres and 60 percent contained. In addition to TFS, other responding resources include two TIFMAS engine strike teams, a TPWD engine, a regional Type 3 incident management team, and suppression aircraft. The Sutton Ranch Fire in Crockett County is currently 1,500 acres and 60 percent contained. The Brown Ranch Complex Fire is now at 50% containment the size is still holding at 16,521 acres. Fire engines from the Texas Intra State Fire Mutual Aid System (TIFMAS) are on the fire helping in the firefighting effort. The Alamo Type 3 incident management team is in place to help manage the incident. Texas A&M Forest Service firefighters are working with local and TIFMAS partners to contain the fire. The Brown Ranch Complex Fire is 16,521 acres in size and 40 percent contained. In addition to the crews on the ground, a helicopter from STAR Flight is assigned to the incident to aid in the fire suppression efforts. The Alamo type 3 incident management team out of San Antonio has been ordered for the incident. The Brown Ranch Complex Fire is located in Edwards County, Texas. The fire is estimated at 9,000 acres with 30 percent containment. A total of three homes were lost in the fire, with numerous other homes saved. Texas A&M Forest Service currently has 31 personnel assigned to this fire with more ordered to help with the incident. Texas A&M Forest Service personnel are working alongside their local government counterparts to safely contain the fire. For questions dealing with evacuations please contact the Edwards County Sheriff’s Office at (830) 683-4104. Yesterday Texas A&M Forest Service responded to 17 fires for 781 acres, including a 400-acre fire in Dimmit County. The Brown Ranch Complex in Edwards County consists of the Brown Ranch Fire (9,000 acres and 30 percent contained) and the HSD Fire (200 acres and no containment).